Below is a brief description of all the major wars the American people have participated in since the first colonist arrived on our shores. The reports only show those military personnel that I have found. There are most probably many, many more that I have not included because I haven't found the paper-proof. They'll be added as they are discovered. Members of the military who were not involved in these conflicts have been added at the bottom. Anyone who commits a portion of their life for the protection of the republic should always be considered a patriot. in based on their birth year. Clicking image will enlarge and open it in a new window/tab. Also known as the American War of Independence, a rebellion of the thirteen colonies against Great Britain. The causes of the Revolution were political, economic, cultural, and geographical. By the Treaty of Paris (1783), Great Britain recognized the United States as an independent nation. The Great Lakes and Canadian border became the northern U.S. boundary, the Mississippi River the western boundary, and Spanish Florida the southern boundary. American deaths totaled 4,435 died during the conflict; the British deaths totaled about 10,000. The war was the culmination of the political American Revolution, whereby many of the colonists rejected the legitimacy of the Parliament of Great Britain to govern them without representation, claiming that this violated the Rights of Englishmen. The First Continental Congress met in 1774 to coordinate relations with Great Britain and the by-then thirteen self-governing and individual provinces, petitioning George III of Great Britain for intervention with Parliament, organizing a boycott of British goods, while affirming loyalty to the British Crown. 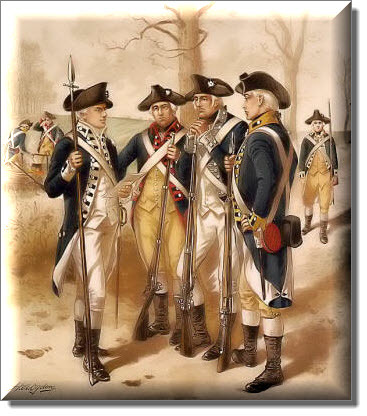 Their pleas ignored, and with British soldiers billeted in Boston, Massachusetts, by 1775 the Provincial Congresses formed the Second Continental Congress and authorized a Continental Army. Additional petitions to the king to intervene with Parliament resulted in the following year with Congress being declared traitors and the states to be in rebellion. The Americans responded in 1776 by formally declaring their independence as one new nation - the United States of America - claiming their own sovereignty and rejecting any allegiance to the British monarchy. See the digital collections on the American Revolutionary War at the Library of Congress website HERE. 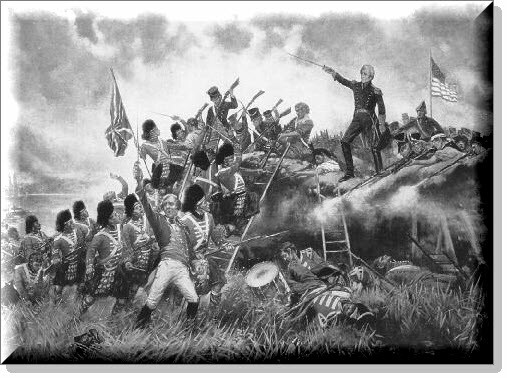 the Battle of New Orleans A conflict between Great Britain and the United States, sometimes called "the second war for independence" and "Mr. Madison's War." During the war between France and England starting in 1793, the British put blockades on European ports to restrict American merchant shipping with France. About 1807 the British stepped up Impressment of American seamen into their navy. The United States passed the Embargo Act, which banned all exports and limited American shipping of coastal trade. In 1810 a group of young Democratic-Republican congressmen from the West called War Hawks urged the United States to defend itself against the British and invade Canada. Congress declared war against Great Britain on June 18, 1812. After negotiations for peace, the Treaty of Ghent was signed, ending the war on December 24, 1814. America lost 2,260 casualties. Much more information can be found at the Library of Congress website including digital images available of historic letters, maps of campaigns etc. Check it out: HERE. 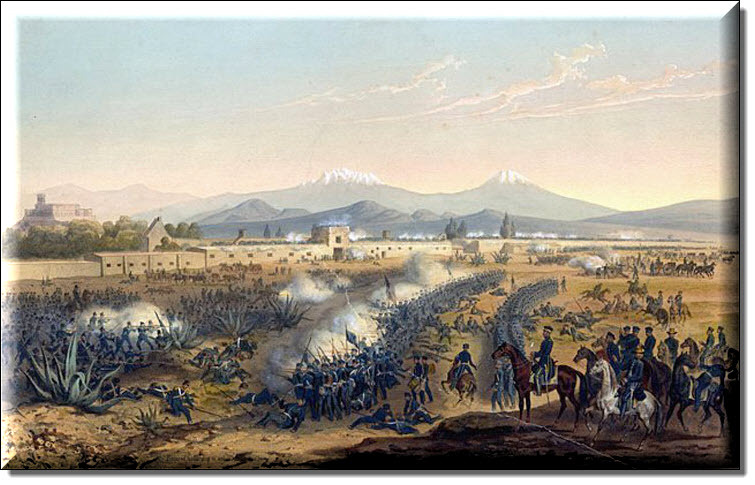 Battle of Molino del Rey, 1847 The Mexican American War was an armed conflict between the United States and Mexico from 1846 to 1848 in the wake of the 1845 U.S. annexation of Texas, which Mexico considered part of its territory despite the 1836 Texas Revolution. In addition to a naval blockade off the Mexican coast, American forces invaded and conquered New Mexico, California, and parts of what is currently northern Mexico. Another American army captured Mexico City, forcing Mexico to agree to the sale of its northern territories to the U.S.
Territorial expansion of the United States to the Pacific coast was the goal of President James K. Polk, the leader of the Democratic Party. However, the war was highly controversial in the U.S., with the Whig Party and anti-slavery elements strongly opposed. Heavy American casualties and high monetary cost were also criticized. The major consequence of the war was the forced Mexican Cession of the territories of Alta California and New Mexico to the United States in exchange for $18 million. Mexico accepted the Rio Grande as its national border, and the loss of Texas. Meanwhile gold was discovered in California, which immediately became an international magnet for the California Gold Rush. The political aftermath of the war raised the slavery issue in the U.S., leading to intense debates that pointed to civil war; the Compromise of 1850 provided a brief respite. at Gettysburg "The American Civil War, 1861-1865, resulted from long-standing sectional differences and questions not fully resolved when the United States Constitution was ratified in 1789. With the defeat of the Southern Confederacy and the subsequent passage of the XIII, XIV and XV amendments to the Constitution, the Civil War's lasting effects include abolishing the institution of slavery in America and firmly redefining the United States as a single, indivisible nation rather than a loosely bound collection of independent states. at San Juan Hill The Spanish-American War was a conflict in 1898 between Spain and the United States. It ultimately ended with the Americans defeating the Spaniards. Revolts against Spanish rule had been endemic for decades in Cuba and were closely watched by Americans; there had been war scares before, as in the Virginius Affair in 1873. By 1897-98, American public opinion grew angrier at reports of Spanish atrocities, magnified by "yellow journalism". After the mysterious sinking of the American battleship Maine in Havana harbor, political pressures from the Democratic Party pushed the government headed by President William McKinley, a Republican, into a war McKinley had wished to avoid. Compromise proved impossible, resulting in an ultimatum sent to Madrid, which was not accepted. First Madrid, then Washington, formally declared war. 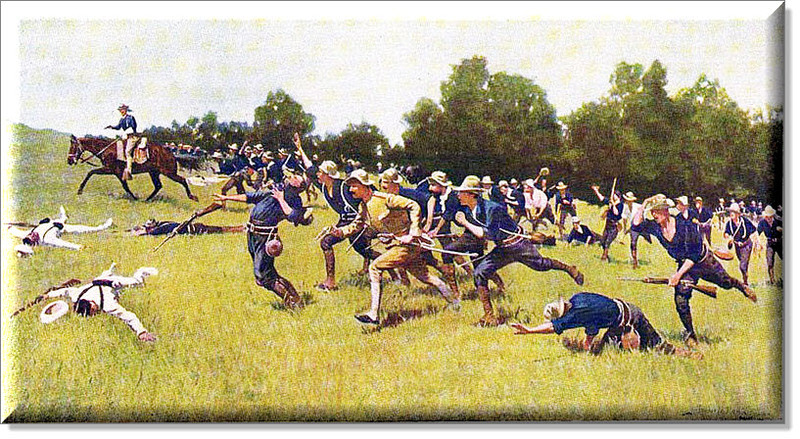 The Battle of San Juan Hill (July 1, 1898), also known as the battle for the San Juan Heights, was a decisive battle of the Spanish-American War. The San Juan Heights was a north-south running elevation about two kilometers east of Santiago de Cuba. The names San Juan Hill and Kettle Hill were names given by the Americans. This fight for the heights was the bloodiest and most famous battle of the War. It was also the location of the greatest victory for the Rough Riders as claimed by the press and its new commander, the future Vice-President and later President, Theodore Roosevelt (Roosevelt was posthumously awarded the Medal of Honor in 2001 for his actions in Cuba). Overlooked then by the American Press, much of the heaviest fighting was done by African-American troops. Much more information can be found at the Library of Congress website including digital images available of historic letters. Check it out: HERE. Battle of Manila, 1899 The Philippine-American War, also known as the Philippine War of Independence or the Philippine Insurrection (1899-1902), was an armed conflict between a group of Filipino revolutionaries and the United States which arose from the struggle of the First Philippine Republic to gain independence following annexation by the United States. 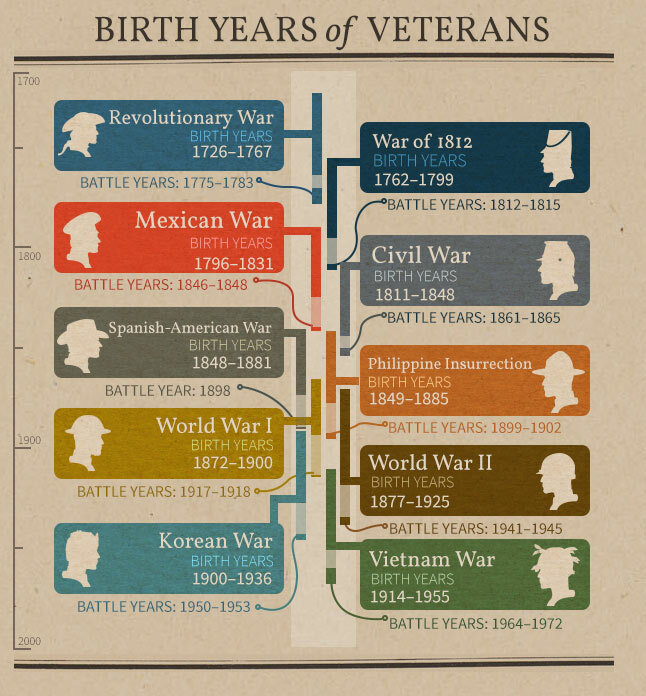 The war was part of a series of conflicts in the Philippine struggle for independence, preceded by the Philippine Revolution and the Spanish-American War. 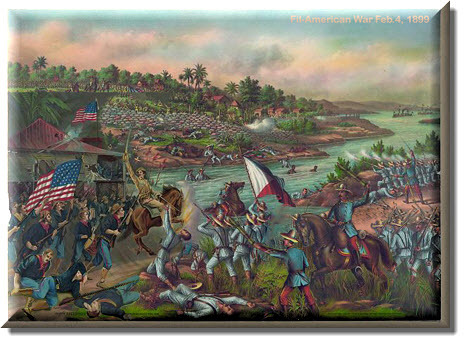 Fighting erupted between U.S. and Philippine revolutionary forces on February 4, 1899, and quickly escalated into the 1899 Battle of Manila. On June 2, 1899, the First Philippine Republic officially declared war against the United States. 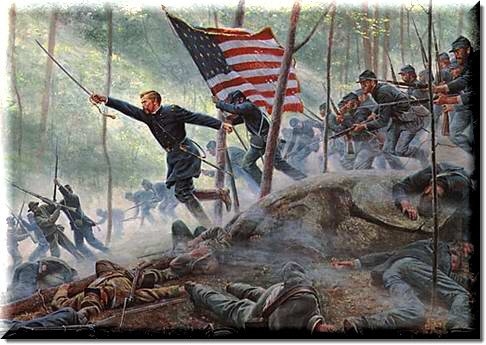 The war officially ended on July 4, 1902. However, members of the Katipunan society continued to battle the American forces. Among them was General Macario Sacay, a veteran Katipunan member who assumed the presidency of the proclaimed Tagalog Republic, formed in 1902 after the capture of President Aguinaldo. Other groups, including the Moro people and Pulahanes, continued hostilities until their defeat at the Battle of Bud Bagsak on June 15, 1913. 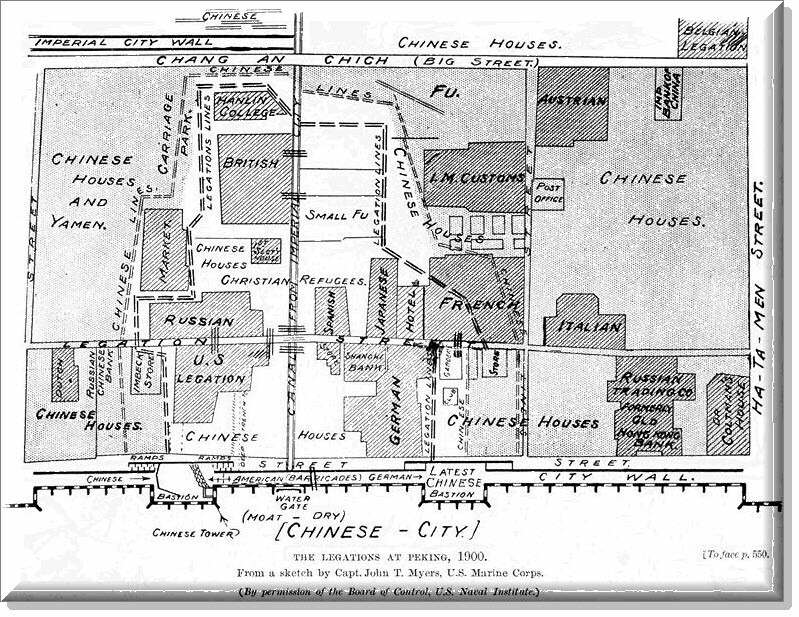 Peking during the Boxer siege, 1900 In June 1900 in Beijing, Boxer fighters theatened foreigners and forced them to seek refuge in the Legation Quarter. In response, the initially hesitant Empress Dowager Cixi, urged by the conservatives of the Imperial Court, supported the Boxers and declared war on foreign powers. Diplomats, foreign civilians and soldiers, and Chinese Christians in the Legation Quarter were under siege by the Imperial Army of China and the Boxers for 55 days. The Chinese government equivocated between destroying the foreigners in the Legation Quarter and extending olive branches. Clashes were reported between Chinese factions favoring war and those favoring conciliation, the latter led by Prince Qing. The supreme commander of the Chinese forces, Ronglu, claimed three years later that he acted to protect the besieged foreigners. The siege was raised when the Eight-Nation Alliance brought 20,000 armed troops to China, defeated the Imperial Army, and captured Beijing. The Boxer Protocol of 7 September 1901 ended the uprising and provided for severe punishments, including an indemnity of 67-million pounds (450 million taels of silver), more than the government's annual tax revenue, to be paid as indemnity over a course of thirty-nine years) to the eight nations involved. See the article titled: "U.S. Marines in the Boxer Rebellion" in Prologue Magazine. It can be seen on the National Archives' website HERE. It's an interesting read. collage of images On June 28, 1914, a young Serbian nationalist named Gavrillo Princip shot and killed Archduke Franz Ferdinand of Austria and his wife Sophie in the streets of Sarajevo in Bosnia. This tragic but relatively minor event had tremendous historical consequences, resulting in more than 10 million deaths. The assassin was a member of a secret Serb society named the Black Hand. Serbian military intelligence officers were complicit in the plot, the purpose of which was to achieve Serbian political independence. The Archduke, a political moderate, was heir to the Austro-Hungarian throne. His visit to Bosnia, which had been annexed along with Herzegovina in 1908, was meant to reassure Slavic people of his good will. Serbian nationalists hoped to liberate Bosnia. The assassination of Ferdinand and his wife ruined any chance of a peaceful resolution. Austria-Hungary demanded punishment of the assassination conspirators by Serbia and then declared war when the response was unsatisfactory. Within a month, the system of alliances and armaments meant to maintain a balance of power for a delicate peace in Europe had created the opposite result. With the full support of Germany, Austria-Hungary attacked Serbia, causing Russia, backed by France, to mobilize for war on behalf of their fellow Slavs. By early August, Austria-Hungary and Russia had declared war on each other; Germany and France did likewise shortly thereafter. When Germany prepared to march through neutral Belgium to invade France, the British abided by their pledges to Belgian neutrality and their entente with France to declare war on Germany. Within a few weeks, Europe was divided into two warring camps: the Allies (Britain, France, and Russia, later joined by Italy, Japan and the United States) versus the Central Powers (Germany and Austria-Hungary, later joined by Bulgaria and Turkey). For more information, visit the Library of Congress website HERE. 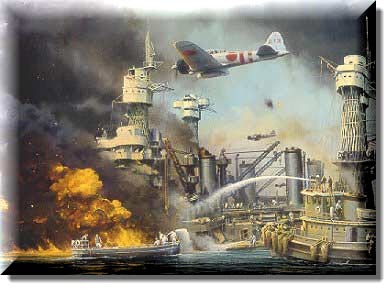 Painting of Pearl Harbor Global conflict involving every major power in the world. The Allies originally consisted of Great Britain, France, and China, but totaled fifty nations, including the United States and the Soviet Union, by the end of the war. The Axis powers of Germany, Italy, Japan and (until 1941) the Soviet Union were eventually joined by six other nations. 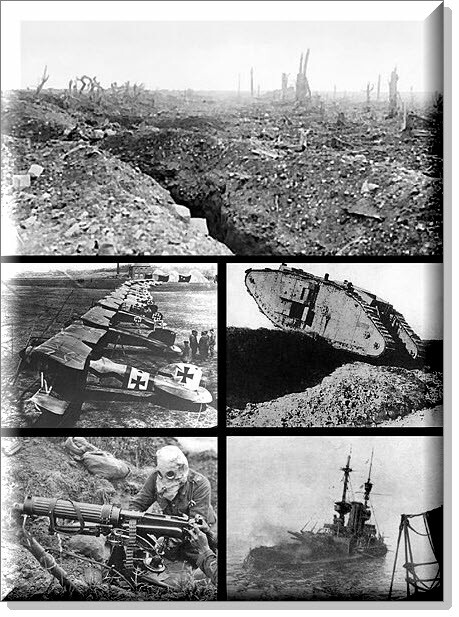 Causes of the war were the rise of imperialist and totalitarian dictatorships in Germany, Italy, and Japan after World War I and a world wide economic collapse, the Great Depression. Military deaths in the worldwide conflict were predictably massive, totaling in excess of 17 million troops. The number of civilian deaths due to bombing raids, starvation, and disease was even greater. When the Allies liberated the death camps in Germany and Poland, they were horrified to discover the extent of the Holocaust that Germany had conducted during the war. Some 12 million people had been murdered, including 6 million Jews. The Soviet Union suffered the most deaths of any single country - about 20 million military personnel and civilians died. The United States lost 405,399 troops. Much more information can be found at the Library of Congress website including external websites & exhibitions. Check it out: HERE. 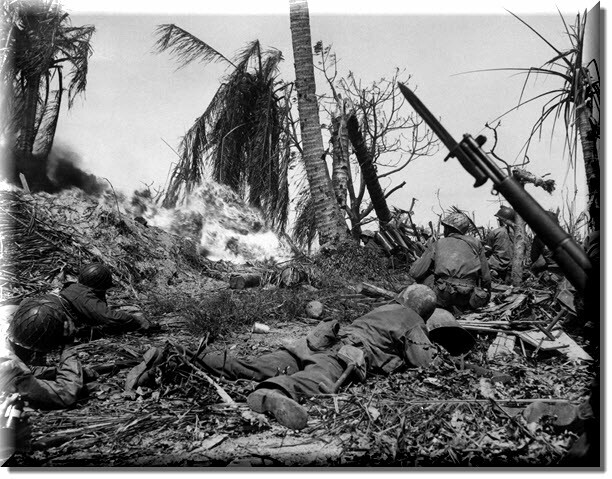 Battle of Kwajalein, Korea The Korean War began in the early hours of June 25, 1950, when North Korean troops crossed the 38th parallel and invaded South Korea. The war featured some of the most intense fighting ever experienced by American soldiers - and some of the worst conditions. Nearly 37,000 American servicemen lost their lives in three years, the majority of losses concentrated in the first year. This is a significantly higher figure per year than the 58,000 American casualties spread over ten years in Vietnam. There were both severe trials and staggering accomplishments during the war: the humiliating retreat of inexperienced U.S. soldiers in the opening days of the war; the brilliant Inchon landings masterminded by MacArthur; the grittiness exhibited in Chosin by the 1st Marine Division surrounded by a vast Chinese force; and the savage hill fighting during the last years of the conflict. Although an armistice was signed in 1953 between the United Nations, the US, China and North Korea, South Korea refused to sign, leaving the two Koreas separate to this day. 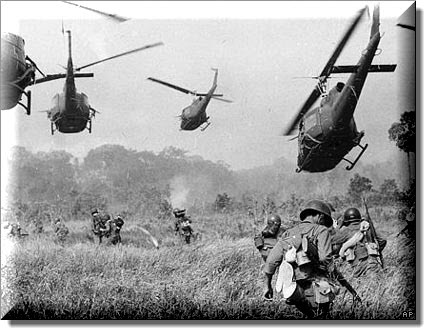 Vietnam War "The Vietnam War is the commonly used name for the Second Indochina War, 1954-1973. Usually, it refers to the period when the United States and other members of the SEATO (Southeast Asia Treaty Organization) joined the forces of the Republic of South Vietnam in contesting communist forces comprised of South Vietnamese guerrillas and regular-force units, generally known as Viet Cong (VC), and the North Vietnamese Army (NVA). The U.S. had the largest foreign military presence and basically directed the war from 1965 to 1968. For this reason, in Vietnam today it is known as the American War. It was a direct result of the First Indochina War (1946-1954) between France, which claimed Vietnam as a colony, and the communist forces then known as Viet Minh. In 1973 a 'third' Vietnam war began - a continuation, actually - between North and South Vietnam but without significant U.S. involvement. It ended with communist victory in April 1975. 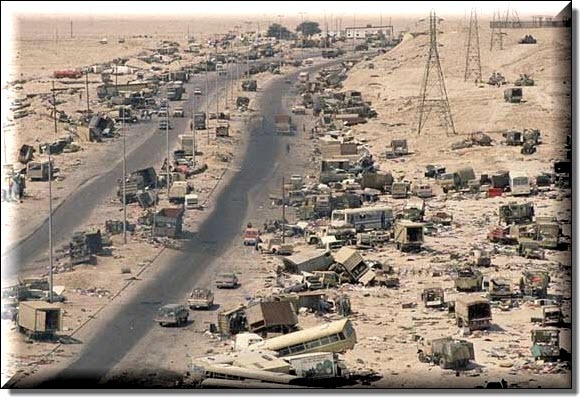 Highway of Death On August 2, 1990, Iraqi forces invaded Kuwait and quickly seized control of the small nation. Within days, the United States, along with the United Nations, demanded Iraq's immediate withdrawal. U.S. and other UN member nations began deploying troops in Saudi Arabia within the week. By January of 1991, over half a million allied troops were deployed in Saudi Arabia and throughout the Gulf region. On January 16, 1991, Allied forces began the devastating bombing of Iraq and her forces in Kuwait. Allied forces launched the ground war on February 23rd. Cut off from their supply bases and headquarters by the intense air campaign, thousands of Iraqi soldiers simply gave up rather than fight, as the Allies pushed through Iraq's defenses with relative ease. By February 26, Allied forces controlled Kuwait City. On February 27th, President Bush ordered a cease-fire and the surviving Iraqi troops were allowed to escape back into southern Iraq. On March 3, 1991, Iraq accepted the terms of the cease-fire and the fighting ended. Original figures listed 100,000 Iraqi military dead, but more recent estimates place Iraqi dead at 20,000 military and 2,300 civilian. The United States had 148 killed in action, 458 wounded. In addition, 121 Americans died through non-combat incidents. pulled down by US troops Brief conflict in 2003 between Iraq and a combined force of troops largely from the U.S. and Great Britain; and a subsequent U.S.-led occupation of Iraq and protracted Iraqi armed insurgency against it. The trade embargo and weapons-inspection process that the UN imposed on Iraq following the Persian Gulf War (1990-91) had partly fallen into abeyance by 2001. U.S. Pres. George W. Bush argued that the September 11 attacks on the U.S. in that same year highlighted the threat to U.S. security posed by hostile countries such as Iraq. In November 2002 the UN issued Security Council Resolution 1441 demanding that Iraq readmit weapons inspectors and comply with all previous resolutions. Although inspectors did return to Iraq, Bush and Blair declared in early 2003 (despite objections by many world leaders) that Iraq was continuing to hinder UN inspections and that it still retained proscribed weapons. On March 20 the U.S. and Britain (with smaller troop contingents from other countries) launched a series of air attacks on Iraq, and a ground invasion followed. 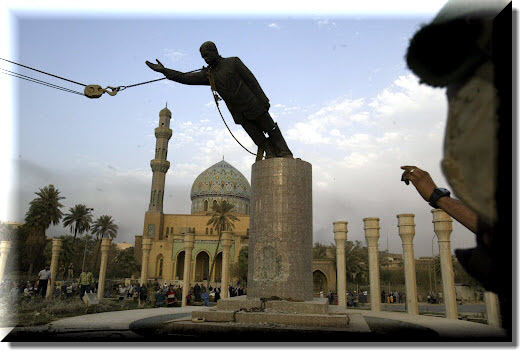 Iraqi forces were rapidly defeated, and on April 9 U.S. forces took control of the capital, Baghdad. British forces completed their occupation of the southern city of Al-Basrah the same day, and by May 1 the major combat operations of the invasion had been completed. However, the U.S. and other occupying forces were soon embroiled in escalating guerrilla warfare in Iraq that hindered Iraq's recovery and killed thousands of soldiers and tens of thousands of civilians. The war, long opposed by many throughout the world, also became increasingly unpopular in the U.S. 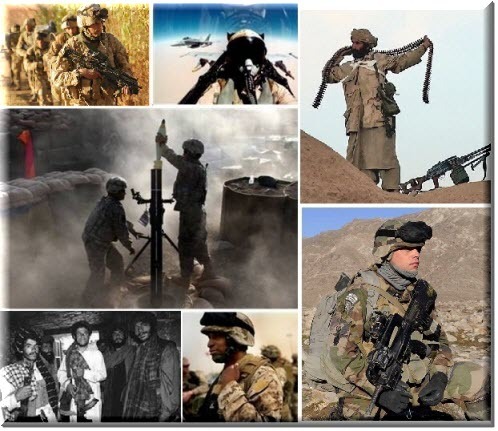 Images of the Afghanistan War The war in Afghanistan is the period in which the United States invaded Afghanistan after the September 11th attacks. Supported initially by close allies, they were later joined by the NATO beginning in 2003 with the stated goal of dismantling the al-Qaeda terrorist organization and ending its use of Afghanistan as a base. The United States also said that it would remove the Taliban regime from power and create a viable democratic state. A decade into the war, the U.S. continues to battle a widespread Taliban insurgency, and the war has expanded into the tribal area of neighboring Pakistan. The War in Afghanistan is also the United States' longest running war. The preludes to the war were the assassination of anti-Taliban leader Ahmad Shah Massoud on 9 September 2001, and the 11 September attacks on the United States, in which nearly 3000 civilians died in New York City, Arlington, Virginia, and Shanksville, Pennsylvania. The United States identified members of al-Qaeda, an organization based in, operating out of, and allied with the Taliban's Islamic Emirate of Afghanistan, as the perpetrators of the attacks. 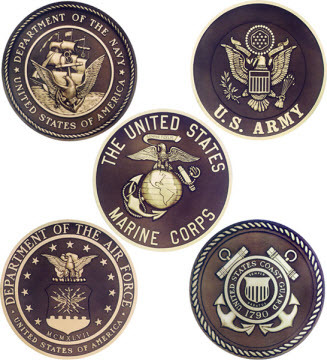 of the Military Those members in the service who were not involved in a war (by the grace of God) but nevertheless served their country and would have certainly stepped into the fight if commanded. We honor them all.